I have been playing about with this birthday present I had from my mum-in-law, a knifty knitter! 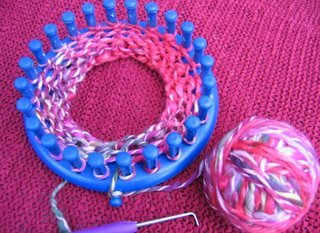 It is basically a small knitting loom, and you can make all sorts of things with looms, like hats, socks, scarves and so on. 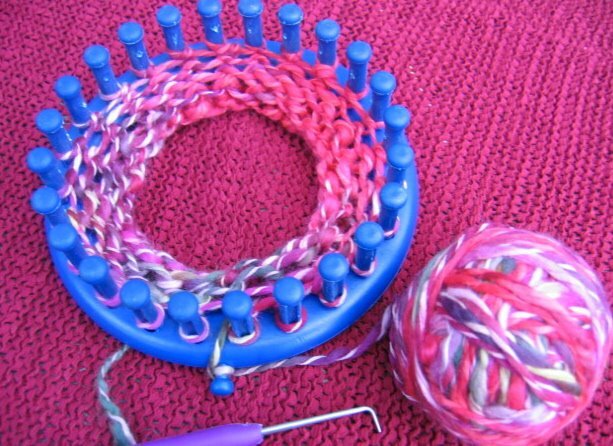 Its a bit like the french knitting you may remember from childhood using a cotton reel with nails in, but with more pegs. I do have difficulty maintaning concentration with crafts involving yarn, so this is good as it is for small projects. talking of small projects, may I present the knitted bangle ta da! Made from gorgeous local welsh Colinette yarn, But I want to make some more of these using this 100% wool yarn (the other is 50% cotton/50% wool mix) and then felt them, I think they will be fab!! I have that same attention span problem myself. 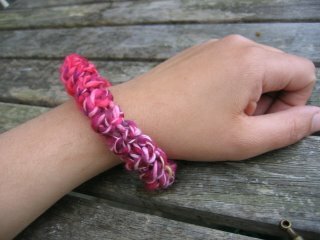 Can't wait to see some felted bangles!! Brilliant, I wondered what kinda stuff it would make. I'll look forward to having one..! !